After the Phoenix Sports v Tonbridge Angels match on Saturday, I was hoping to make it a football filled weekend with the Halstead Town v Colchester United legends game on the Sunday. However, lazy colleagues who had phoned in sick after no doubt being out on the booze the previous night put paid to that. I knew something was up when I noticed my manager was working - firstly it was supposed to be his day off, and secondly he doesn't usually get involved with work, normally swanning around with a can of energy drink in one hand and a mobile in the other, whilst dragging out the whole work process for as long as possible. I finished my own job at around 10.30 and on any normal day could have gone there and then. But seen as I was contracted till 12, plus the fact that I had been asked to help out others, I had to stay, eventually getting out at 1PM as the game was kicking off 90 minutes down the road. I was not in the best frame of mind as I was looking forward to meeting mates as well. I myself last had a day off sick over 14 years ago, so it annoys me when others don't make the effort. It didn't get any better on Monday with it being the usual busiest day of the week and as it was November, the store had put on Christmas music. Not the upbeat stuff like Slade and Wizzard though, but dreary carols. In any case I was glad to be off on the Tuesday to get a rest from it all. 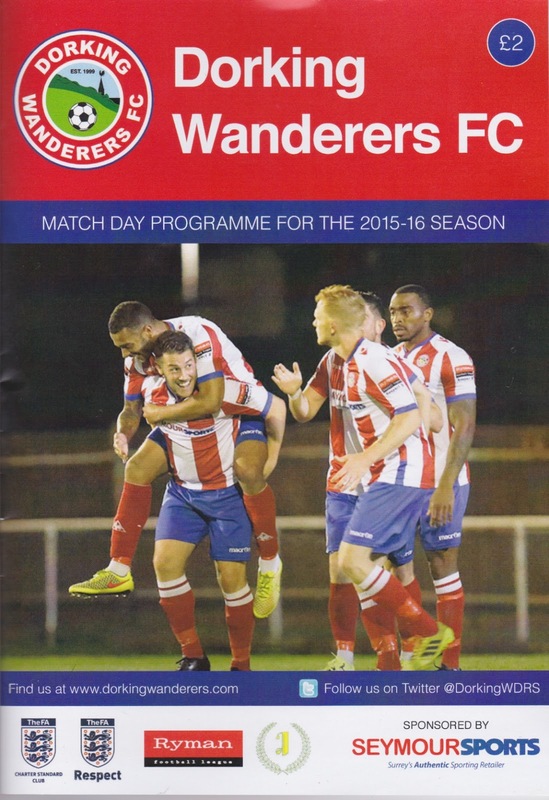 I'd already decided it was going to be an FA Trophy or Vase game for tonight, and Dorking Wanderers got the nod over the likes of Welton Rovers, Mildenhall Town & Blidworth Miners Welfare. Tonight's game courtesy of a 1-1 draw down in Taunton on Saturday, where they had their keeper to thank for keeping them in the tie, equalising with a late penalty. DORKING WANDERERS were formed in 1999, making them one of the newer clubs in the country. They've come a long way in a short amount of time too, starting out in the Crawley and District League, before progressing up through the West Sussex League. In 2007 they joined the Sussex County League at Division 3, winning the Championship in 2011. It was promotion 2 seasons in a row as they finished 3rd behind Hailsham Town & East Preston to seal promotion to Division 1, which sits at step 5 of the non league pyramid. After initially avoiding relegation in their debut season of 2012-13, the following season saw a much improved finish of 8th. Last season they did even better, finishing 2nd behind Littlehampton Town. 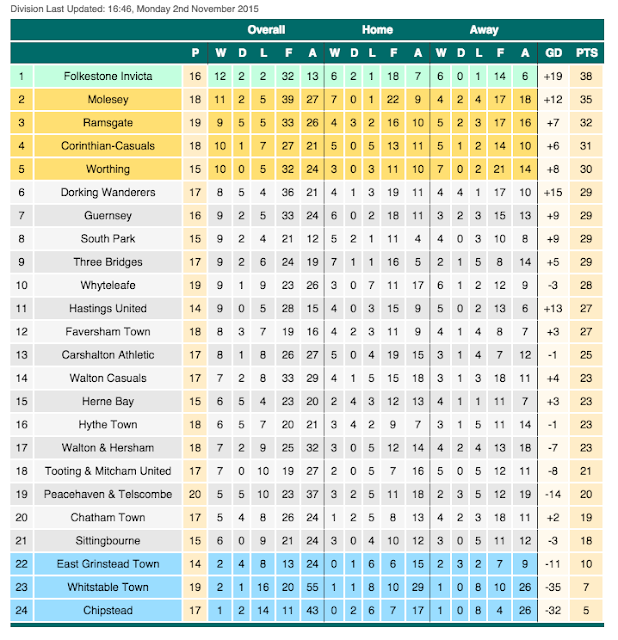 But with the Champions not taking promotion, they gratefully accepted a place in the Ryman D1 South for this season. They'd enjoyed an excellent start too, currently sitting in 6th place, just outside the playoffs. As for the cups, the best FA Cup run came last season. 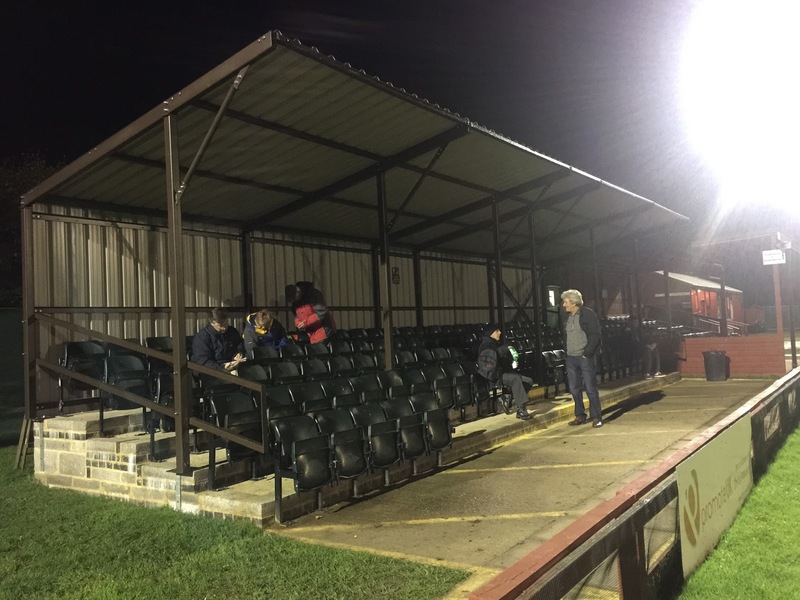 Beating Crowbrough, Sittingbourne and Pagham, they lost to a Biggleswade Town side who had reached the first round during the previous season. No real success had been had during their 3 seasons in the FA Vase, Since their elevation to step 4 of the pyramid they now play in the FA Trophy and had beaten Burnham 2-0 to get this far. Locally the club have been runners up in the Sussex Premier Cup, Sussex Intermediate Cup and SCFL Division 3 Challenge Cup during the past 10 years. On the day of the game I had my usual walk down town. Coming back I sent the time doing a few little jobs of my long ‘to do’ list before leaving to meet Anwar and arriving in Aylesbury at 4.15. We had a pretty good journey going by the standards of the M25, only being delayed by 20 minutes. We'd already planned to have dinner at Morrisons in Reigate before and got there at 6.10. 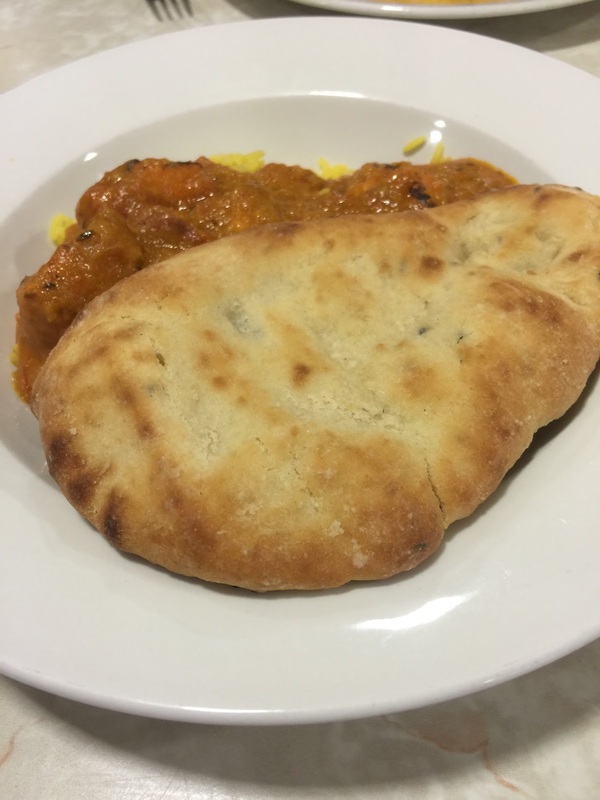 I had Chicken Tikka Massalla and Anwar had cheese omelette . After stopping in store to pick up a Rocky Road cake we were on our way for the short drive to the ground. The 6 mile journey took around 15 minutes to get there. After parking up we paid £8 to get in, plus £2 for a programme. I took some pictures of the ground and went and had a look in the bar. They only had bottles of Bulmers so I decided to stay tea total for the night. We selected a spot near the halfway line and I spent the 25 minutes before the game updating my blog on my phone and looking on Facebook. There was a lengthy delay to the start of the game while the referee fannied about. The players were stood in the tunnel for 5 minutes waiting for him and then there was a few minutes delay on the pitch which meant it kicked off at 7.53. When it did Taunton were well on top with their first chance flashing wide of the left hand post after 90 seconds. The hosts were restricted to chances on the break- on 9 minutes a cross went wide of the right hand post with no one making a connection. The visitors took a deserved lead on 21 minutes, a clever backheel across the edge of the area set up Jordan Rogers and he finished from inside the D.
The 20 or so Taunton fans that had made the long trip were in good voice and this goal made them delighted. 4 minutes later they were delirious as their side took a 2-0 lead. Jamie Short's shot hit the post before going in. The 37th minute saw a great save from the home keeper Gary Ross to deny Taunton a third. It was just a brief respite though as a couple of minutes later the visitors pretty much sealed the game. Jordan Rogers great shot into the top right hand corner was his second and his sides third. At half time the tannoy played 'I need a miracle' , quite appropriate given the scoreline from the point of view of the home side. It was the visitors that were the better side again but there wasn't many clear cut chances at the start of the second half. Max Briggs did give Dorking Wanderers hope with a great shot into the top right hand corner but they never seriously threatened a comeback. 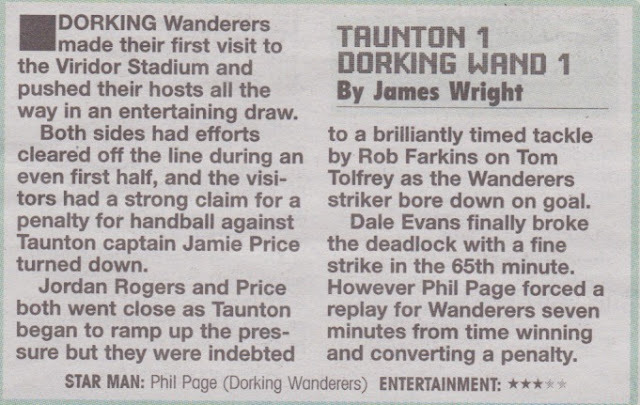 There was a coming together between Taunton's Jamie Price and Dorking's Phil Page on 65 minutes. It was completely accidental but both players required lengthy treatment and the resulting injury meant that Page had to be substituted. That was about it - there was a foul and yellow card for the visitors which led to a minor scuffle. Not that they would have been that bothered, they were good value for the win. Taunton now face Bognor Regis Town in the next round. By the time we got out it was 9.50 and after a 5 minute delay on the M25 due to a lane closure I dropped Anwar off in Aylesbury at 11, getting home myself 20 minutes later. I was pleased to see that Tonbridge Angels had won 2-0 for my mates after their poor showing on Saturday, though it was a shame Anwar's Aylesbury team lost to Brentwood as they would have had a trip down to Bideford in Devon with strong possibility of a good value coach and a day on the cider. The vacancy on that Saturday, the 14th, came about after Wycombe's game against Notts County was called off due to international call ups. As a result I will be going over a month without a home game and am pretty fed up with the over saturation of international football and pointless friendlies that are ruining the game and disrupting the football season. WESTHUMBLE PLAYING FIELDS is a 3 sided ground, with the touchline you enter on being closed off to spectators although this adds to the charm of the place. You'd expect a club that has progressed so far in so short amount of time to have the standard metal 'Arena' stands but this isn't really the case. There is a metal terrace behind the goal with a capacity of around 100, but it is of a different design to the bog standard one. Along the side there are 2 stands, probably with a total of around 250 seats. The rest of the ground is open hard standing, with a capacity in total of 1500. The bar and tea bar are alongside the 2 stands and are of an attractive wooden design. As for what they offer, I can't say but they seemed to be pretty good. There's a fairly decent range of merchandise too. All in all the ground has a good bit of character and the people are friendly making it well worth a visit.